Vancouver Cherry Blossom Festival is about more than just looking at petals; it’s also about taking artistic inspiration from them. 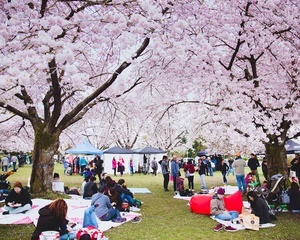 Each year, the festival kicks off with the free Cherry Jam Downtown Concert–a musical homage to the season featuring dance groups, bands and the Vancouver Metropolitan Orchestra performing under the fluttering cherry blossoms at Burrard Station. For those that have found their own inspiration among the snowy petals, the festival offers a Haiku Invitational competition and a BC Blossom photo contest that’s open to everyone. Thanks to over 40,000 cherry trees lining the streets of the city, crowds of visitors arrive in Vancouver each spring to celebrate the clouds of light pink blossoms that dominate our neighborhoods during the season. Running from the end of March through to mid-April each year, the Vancouver Cherry Blossom Festival offers a cultural calendar full of opportunities to capture their beauty, including a line-up of arts events, community bike rides, cherry blossom viewing tours and traditional Japanese festivities.